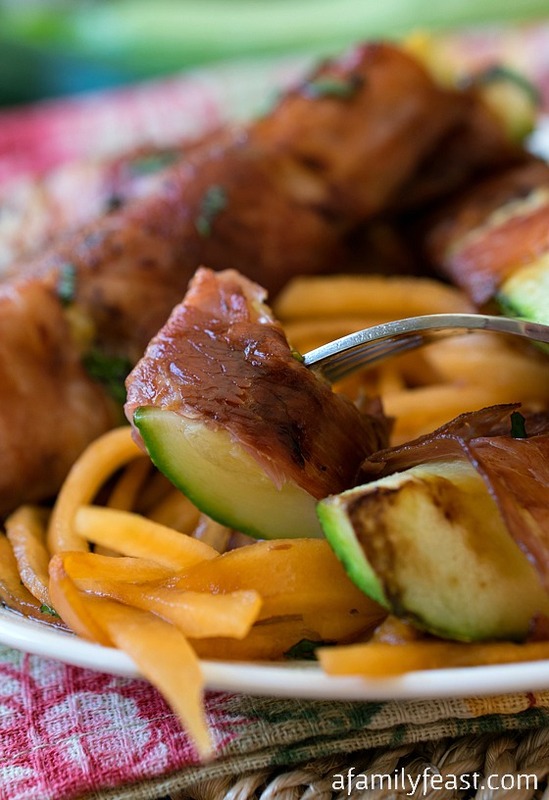 This Prosciutto Wrapped Zucchini Over Melon Pasta has an unexpected combination of flavors – and it’s perfectly fantastic! 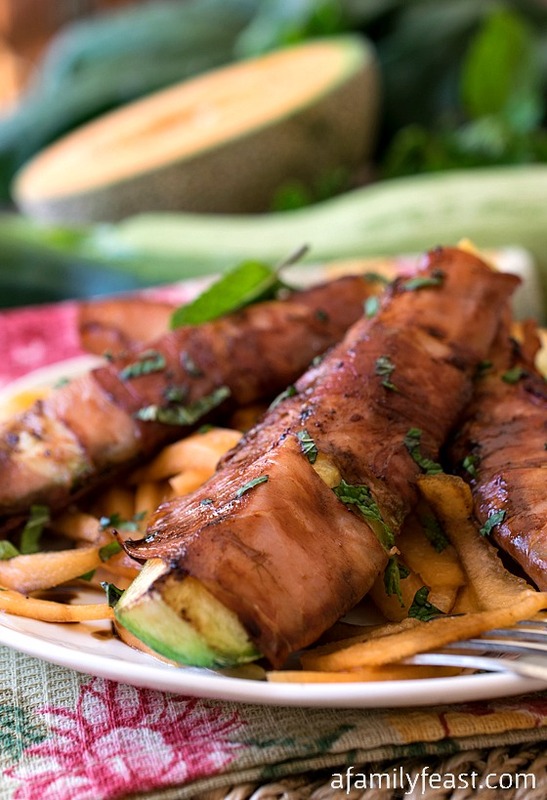 Wedges of fresh garden zucchini are wrapped in thin slices of prosciutto, then sautéed until the zucchini is tender and the prosciutto is crispy. Then it’s served over a bed of melon ‘pasta’ – cantaloupe that we cut into thin strips. 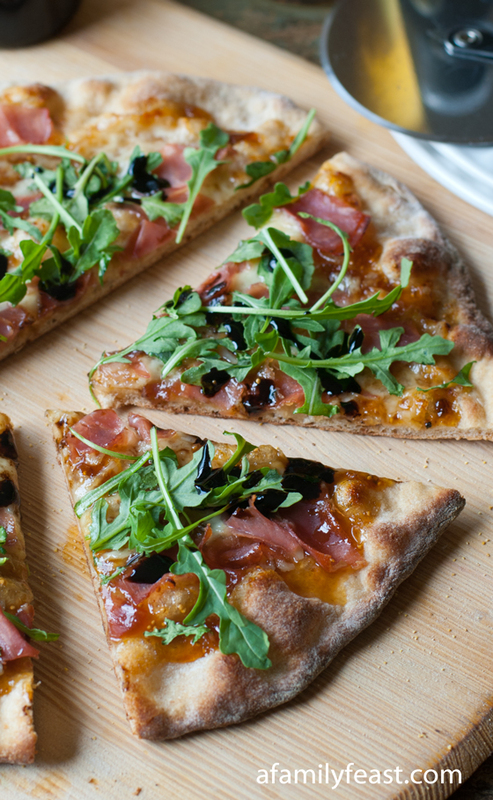 Finally a light drizzle of a sweet, zingy balsamic reduction finishes off this simple dish! 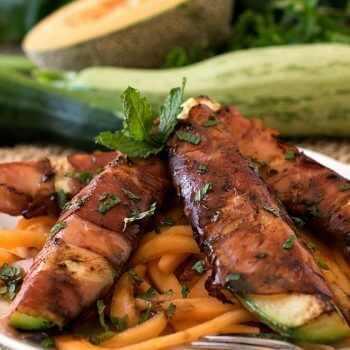 The flavors in this prosciutto wrapped zucchini over melon pasta are a little bit salty from the prosciutto and a little bit sweet from the melon and the balsamic reduction. 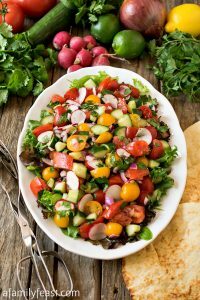 This dish is a different and very delicious way to enjoy fresh garden zucchini – but you can also eat this wonderful salad year round thanks to all of these ingredients being available all year at your local supermarket! 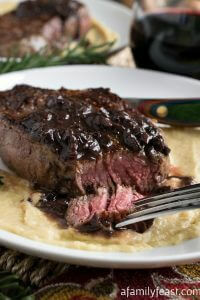 It’s delicious eaten hot or cold, crispy or soft and super tender, and with or without the balsamic dressing! Adapted from one of our favorite cookbooks, The Tra Vigne Cookbook: Seasons in the California Wine Country . Note: Try to buy a prosciutto with as little fat as possible. The brand we used was found at our local market and it was actually the domestic option. It was less expensive than the imported and better suited for this dish. It was very meaty and a little dry, which was perfect for getting a crispy wrap in this dish. In a small pan, bring vinegar, sugar, salt and pepper to a boil then reduce to a simmer and cook until the liquid has reduced to about 1/3 cup, about five or six minutes. Add a little water if it is too thick when done. Cut the cantaloupe the long way vertically, and seed. Take one half and slice a small piece off one end so it will stand upright. Then with a sharp knife, run between meat and skin and discard skin. Repeat for other half. Then lay the cleaned melon half seeded side down and make thin slices from one end to the other. Then lay each slice flat and with your knife or a paring knife, follow the contour of the slice and cut into strips so when you are done, the strip resembles a piece of linguini. Repeat for all slices and both halves and place in the refrigerator. Take each zucchini and nip off both ends. 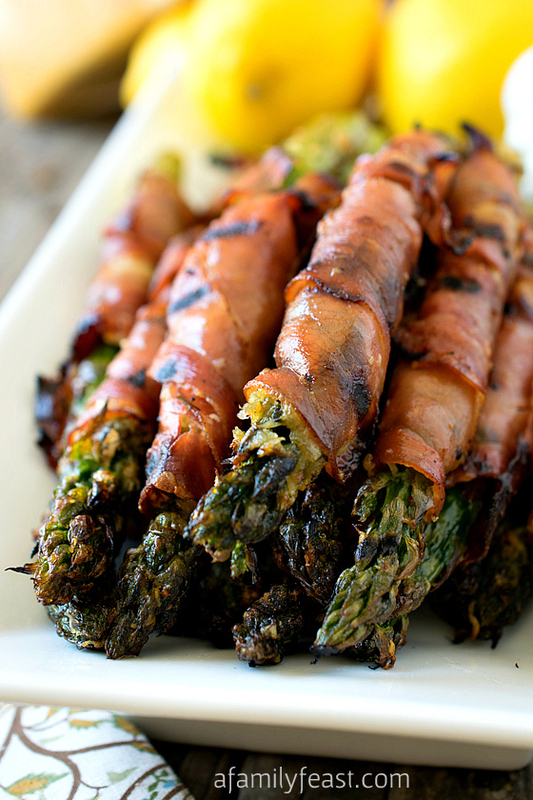 Divide each zucchini in quarters and wrap each quarter with two slices of prosciutto covering the zucchini surface. Repeat for all pieces. In a large sauté pan, heat oil over medium heat and place prosciutto wrapped zucchini in. 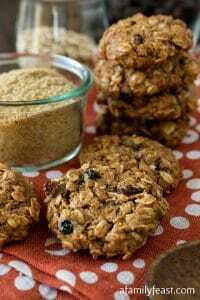 (you will need to cook in batches). Brown each side (three sides) for about 2 minutes on each side or until they brown. The zucchini will not be cooked through but that is what we want in this dish. Repeat for the remaining pieces. 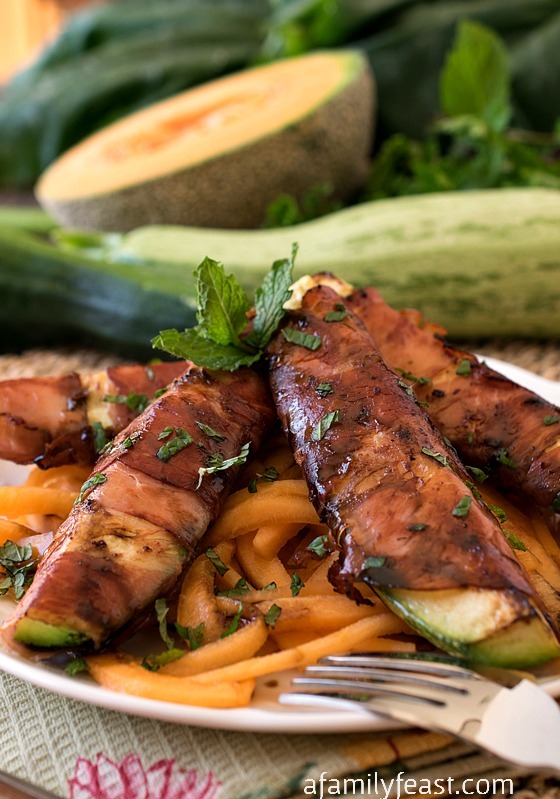 To serve, pile the melon like pasta on four plates, place four pieces of the browned wrapped zucchini over the melon pasta and drizzle some of the balsamic reduction over the top of each. Then sprinkle with the chopped mint or parsley. HOLY cow. I love everything about this Martha. Well done. Looks great. I wonder if I could put the cantaloupe through my spiralizer? It’s just a fun tool that I usually use for zucchini noodles. I will have to try it. I actually won my spiralizer in a contest and I am really have a lot of fun with it. I was skeptical at first until those curly zucchini noodles starting coming out. Thanks for your prompt reply. Really enjoy your recipes. Wow is this an elegant, unique recipe. And its not that hard, but it looks like you really knocked yourself out. 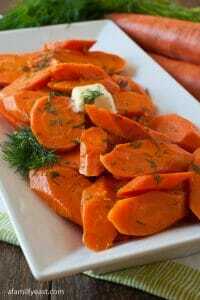 I love sly dishes like that. Ha! I had to pin it and the similar asparagus one. Delish! You’re exactly right Carol – it does look a lot fancier than it is! Thanks for visiting us today! 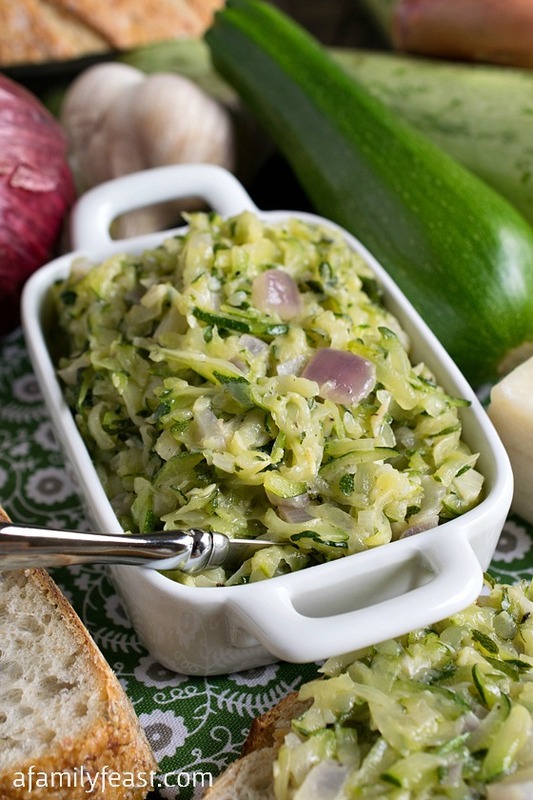 Wow another way to use all that Zucchini that’s coming in our garden. We didn’t grow any melons the season isn’t quite long enough in Buffalo. I hate to admit this but I’ve never eaten prosciutto before. It looks delicious. You’ve never steered me wrong before so I’m passing it on to my wife to whip up! We’re in Massachusetts Tom – and like you, our growing season isn’t long enough to grown melon either (we’ve tried!). 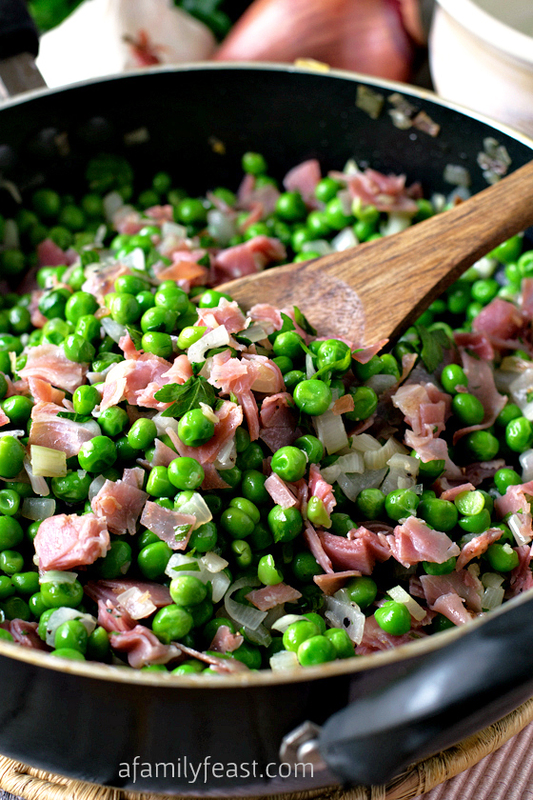 I hope you try the recipe – and I predict you’ll LOVE prosciutto! It’s delicious!